The colder months are here and to warm you up a bit on a cold night the City of Perth is offering a whole range of food and drink deals in some of the top restaurants, cafés and bars that Perth has to offer. Run in conjunction with the Perth Winter Arts Festival, all Winter Bites offers will be available during June, July and August, 2013. The Winter Bites booklet contains a whole range of fantastic food and beverage options and there are some great specials and deals on offer. All food and drink offers are available from 1st June until 31st August, 2013 and can be redeemed on booking by mentioning the Perth Winter Arts Season. Gather your family and friends together and head into the city for some fun. Enjoy breakfast, lunch, dinner, drinks or one of the many all day deals available, perfect for before or after one of the dazzling Winter Arts Festival events. The Winter Bites booklet is being offered for the first time and contains vouchers for some of the best restaurants, cafés and bars in the Perth area. There are all sorts of great deals available such as two for one meal deals, free coffee and dessert, 10%, 20% and 25% off, buy one get one free, cheap meals and much more. One of the highlights included in the Winter Bites booklet, and returning to the Perth Town Hall again this year, is the popular Winter Supper Club. Come along on the last Friday of each month for a serving of warm winter foods and hot live music performances. You do need to use the actual booklet vouchers so order a booklet now. Check out the digital Winter Bites booklet on-line and see what there is on offer. It's so easy - order the booklet, use the vouchers, get great deals and save money. 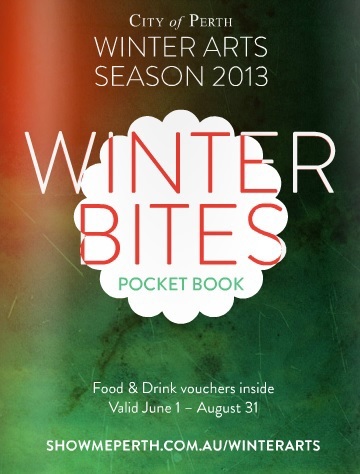 You can order your free Winter Bites booklet from the City of Perth, Show Me Perth website now. For further details about the Winter Bites 2013 check out the Show Me Perth website.